To Cite: Javid M, Hadian M, Rezapour A, ‎Salehi M, Toroski M. Cost-Utility Analysis of Laparoscopic Cholecystectomy and Open Cholecystectomy in Kashani Hospital, Shahr-e-Kord, Iran, Iran Red Crescent Med J. 2018 ; 20(S1):e27885. doi: 10.5812/ircmj.27885. Background: A cost-effectiveness analysis is used to evaluate and compare the cost versus the benefits of different treatment modalities. The clinical effectiveness of laparoscopic cholecystectomy has been well documented. To our knowledge, there was no published data on the cost-utility of laparoscopic cholecystectomy in Iran. Objectives: This study aimed to compare the cost-utility of the two surgical methods for removing gallstones: open cholecystectomy and laparoscopic cholecystectomy. Patients and Methods: In this comparative cross-sectional analysis, we investigated the data of patients who had undergone laparoscopic and open cholecystectomy operations in Kashani hospital, Iran, between 2012 and 2014. Using the available samples, two groups of 30 patients were randomly selected. SF-36 was used to assess the quality of life (QoL) of patients 30 to 35 days after operation, and quality-adjusted life years (QALYs) were calculated by multiplying the SF-36 score by healthy years of life. An activity-based costing method was used to determine the costs of the operations. The cost-effectiveness ratio (CER) was calculated by dividing the costs of each method by the gained QALY. To determine the difference between the two surgical methods, we used independent-samples t test. Results: The data of 60 patients, 40 men and 20 women, with the mean age of 54.30 ± 16.44 in the laparoscopic group and 51.77 ± 18.41 in the open cholecystectomy group were analyzed. The mean cost of surgery was lower in the laparoscopy group (2259 ± 895 USD) than in the laparotomy group (2972 ± 907.9 USD) (P = 0.003). The mean SF-36 score was higher in the laparoscopic group (65.98 ± 9.22) than in the open cholecystectomy group (58.03 ± 11.30) (P < 0.004). The cost of gaining QALY was also significantly lower in the laparoscopic group. The mean of the gained QALY index was 1.79 ± 0.29 and 1.14 ± 0.41 for the laparoscopic and open surgeries, respectively (P < 0.001). The incremental CER was 1067 USD for each QALY for the laparoscopic group in comparison to the value of open cholecystectomy. Conclusions: Laparoscopic cholecystectomy was more cost-effective than open cholecystectomy and is therefore preferred and recommended in patients with gallstones. The health sector plays a vital role in society due to the protection it provides for human life. However, the services it provides can be expensive. Consequently, governments try to increase effectiveness while decreasing the costs of health care (1). While most countries do not use formal economic analysis for decision-making in the formulation of healthcare strategies, some do use cost-effectiveness analysis (CEA) quite frequently. For instance, Canada (2), the United Kingdom, Brazil (3), and Sweden (4) use CEA to determine the relative cost-benefits of preventive measures or alternative treatments (5). Although appropriate programs and treatment strategies benefit both the patients and the system, their implementation can be costly; therefore, limited financial resources are available for choosing programs to promote the quality of life (QoL) and increase the life expectancy of patients (6). Generally speaking, CEA quantifies benefits in terms of a natural unit. In the healthcare system, CEA is the main method of economic evaluation. In recent years, cost-utility analysis (CUA) has been introduced and recommended as a method of CEA. The natural unit used in CUA is the quality-adjusted life year (QALY) (7, 8). The CUA results are presented as a cost-effectiveness ratio (CER) of two treatment modalities, which is calculated by dividing the difference in cost by the difference in QALY. In other words, CER estimates the cost of gaining one additional QALY through comparing two modalities and helps to determine the value of one treatment method over another according to their cost-benefit ratio (9, 10). Gallstones are a common medical condition that mandate surgical removal of the stone(s) through open or laparoscopic cholecystectomy. One decade after first introducing the method of laparoscopic cholecystectomy, this approach is now the gold standard procedure for gallstone removal (11, 12). According to a meta-analyses of randomized clinical trials by Siddiqui et al., laparoscopic cholecystectomy has an acceptable safety profile and shortens the hospital stay of patients more than open cholecystectomy procedures (13). Other studies on CEA indicated fewer surgical complications, less severe postoperative pain, shorter hospital stay, and more rapid recovery in early rather than in delayed laparoscopic cholecystectomy (14, 15). The purpose of CUA is to estimate the ratio of the cost of intervention to the subsequent health benefit. To our knowledge, there was no published data on the cost-utility of laparoscopic cholecystectomy in Iran at the time of this study. Hence, this study was designed to compare the cost-utility of open cholecystectomy with laparoscopic cholecystectomy. This comparative cross-sectional study compared the cost-effectiveness of open cholecystectomy with that of laparoscopic cholecystectomy in Kashani Hospital, Shahr-e-Kord, Iran, between 2012 and 2014. When patients enter public hospitals, they sign an informed consent so that their data can be used for research purposes. Although this was not an interventional study and only data regarding days in the hospital and their costs according to accounting records in the hospital were used, the study was conducted after achieving approval of the hospital ethics committee (SHMIS-803). Informed consent was also obtained from all participants after informing them of the study protocol and ensuring them that their information would be kept confidential. As this was an accounting study on the costs of two treatment modalities, there were not any eligibility criteria for the included patients. Samples were chosen according to availability and completed data on the patients’ files (about 200) and then computer-produced random sequence numbers were used to select files to include in the study. Two groups of 30 patients were randomly selected among those who had undergone open or laparoscopic cholecystectomy. Those who did not fulfill the above mentioned criteria were excluded from the study. A short-form health survey (SF-36) was used to measure the participants’ QoL. SF-36 is a globally used method of assessing QoL which evaluates eight relevant criteria: 1, role limitations due to physical health; 2, social functioning; 3, general health; 4, energy/fatigue; 5, physical functioning; 6, pain; 7, role limitations due to emotional problems; and 8, emotional well-being, each for two different aspects of health, i.e., mental and physical, in a preference-based questionnaire. The validity and reliability of the Farsi language version of the SF-36 was reported in previous studies (16), and thus this version was used in this study. After the patients completed the questionnaires, the resulting scores in the assessed dimensions were calculated; the final score was determined by calculating the average score of all criteria. QALYs, derived from the SF-36, were calculated between 30 to 35 days after cholecystectomy for both groups. The QALY index was calculated by multiplying the total QoL score by the healthy years of life. Open and laparoscopic cholecystectomies were the main cost objects of this study, and their costs were determined by the activity-based costing (ABC) method. In this system, the general surgery department of the hospital was divided into two patient groups. The first patient group had not undergone surgery and only needed medical therapy. The other patient group had undergone open, laparoscopic, and other surgical operations to resolve gallstone complications. The costs to the general surgery department were divided into direct and indirect costs. Total direct costs such as drugs, materials, and nurse and doctor salaries were directly assigned to open and laparoscopic cholecystectomies. The indirect costs included all costs that could not be assigned directly to open and laparoscopic cholecystectomies and were calculated using cost drivers. The total direct costs for the general surgery department were calculated by summing the materials, capital, and human resource costs. To determine the indirect costs, a resource cost driver was used. Details of the activity-based costing method are reported in other hospital accounting studies (17-23). Finally, the CER was calculated according the method mentioned previously. No discount rate was applied to the costs, and all costs were in the United States dollar (USD) at the 2012 mean exchange rate. Statistical analysis was performed using SPSS 12.0 (SPSS Inc., Chicago, Illinois, U.S.A.). The Kolmogorov-Smirnov test was performed to determine the normal distribution of the variables. Because all of the variables had a normal distribution, an independent-samples t-test was used to determine the difference between the two surgeries. A P < 0.05 was considered statistically significant. Forty women and 20 men were included in this study. The mean age of the participants was 54.30 ± 16.44 in the laparoscopic cholecystectomy group and 51.77 ± 18.41 in the open cholecystectomy group. After the open and laparoscopic cholecystectomies were performed, the patients needed to stay in the hospital for 3.7 days and one day, respectively. The mean cost was 2259 ± 895 and 2972 ± 907.9 USD for the laparoscopic and open cholecystectomy operations, respectively (P = 0.003). The mean score of QoL was 65.98 ± 9.22 and 58.03 ± 11.30 in the laparoscopic and open cholecystectomy groups, respectively (P = 0.004). Table 1 demonstrates the mean of the scores for the eight criteria of QoL for each group. The cost per each gained QALY was 1234 and 2607 USD in laparoscopic and open cholecystectomy groups, respectively. The mean of the gained QALY index was 1.79 ± 0.29 and 1.14 ± 0.41 in the laparoscopic and open cholecystectomy groups, respectively (P < 0.001). In comparison to the open cholecystectomy group, the incremental CER for laparoscopic cholecystectomy group was 1096 USD for each QALY. Figure 1 illustrates the gained QALY in each group for the different age groups. In this study, the respective cost-utilities of the two gallstone removal surgeries were compared. The laparoscopic cholecystectomy group’s gained QALY was 0.66 more than that of the open cholecystectomy group. Moreover, the cost per QALY in the laparoscopic cholecystectomy group was 1096 USD less than the corresponding cost for the open cholecystectomy group. The mean score of QoL was higher for the laparoscopic cholecystectomy group than for the open cholecystectomy group. In comparison to the open cholecystectomy group, the means of all QoL dimensions were higher in the laparoscopic cholecystectomy group, except for emotional well-being. The higher score for emotional well-being in the open cholecystectomy group might be due to some personal differences. 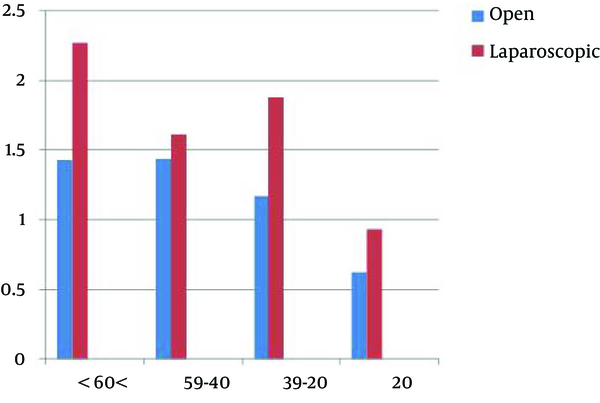 The gained QALY in all ages was higher in the laparoscopic cholecystectomy group than in the open cholecystectomy group. In both groups, the QALY of patients older than 60 years of age was the lowest among all age groups, which might be due to coexisting diseases or conditions. Although there was no previous research on the CUA of laparoscopic cholecystectomy in Iran, the QALY index has been used to determine the CEA of different methods of treating gallstone diseases. Previous studies have used EQ-5D (EuroQoL-Five Dimensions Questionnaire) as a standard tool to evaluate the QoL in patients with gallstone diseases (13, 14, 24). A CUA study of cholecystectomy mentioned that traditional questionnaire usage was a weak point of the study and recommended SF-36 as a more effective tool (25). Although the QALY index is frequently used in CEA, some experts disagree with using it for health management decisions and consider it to be insufficient. Despite some opposition, most CUA studies have used the QALY index because of limitations on the available analysis methods in the healthcare domain (26). The QALY index is a simple tool for resolving complex choices, and the results of QoL surveys are affected by cultural differences. Therefore, QoL should be evaluated through tools with proven validity and reliability for each individual language and region (27, 28). This preliminary study was the first CUA of laparoscopic cholecystectomy by SF-36 in Iran, but there were some limitations. The most important limitations to our study were the small sample size and the short follow-up period. Furthermore, this study for cholecystectomy was based on hospital data available from 2012 when the mean length of hospital stay for open cholecystectomy was 3.7 days, which was longer than the mean length of hospital stay in most reports. The hospital costs for laparoscopic cholecystectomy might decrease if the mean length of hospital stay in routine clinical practice decreases with an increase in the experience of the practitioners. Additionally, further studies that involve a larger population and a longer follow-up period are needed to provide more information on this issue. The costs of probable adverse effects and discount rates were not included here; if these costs had been included, the difference of the CER would have been higher. In most reports, the less expensive cost of hospitalization for laparoscopic cholecystectomy than for open cholecystectomy has been attributed to shorter hospital stay. On the other hand, a few studies reported no significant cost savings or even an increase in total hospital costs for laparoscopic cholecystectomy (29, 30). Although the total direct cost for the surgery department and recovery unit are higher for laparoscopic cholecystectomy, the shortened length of hospital stay and more rapid return to normal activity lead to both direct and indirect cost savings. Despite the mentioned limitations, the findings of this study demonstrated that laparoscopic cholecystectomy was more cost-effective than open cholecystectomy. As mentioned previously, this was an accounting study on costs of treatment. In Iran, all hospitals have the same cost for admission, staying in hospital, specific procedures, and treatments, which are determined by the ministry of health and regulated to be the same throughout the country. Therefore, the applied costs can be generalized to all public hospitals in Iran. Finally, given the successful results of this study, routine use of formal economic analysis for decision making in the Iranian health system is recommended. This study was part of a Ph.D. dissertation supported by Iran University of Medical Sciences (Grant NO: IUMS/SHMIS-803-2013). Conflict of Interest: The authors declared no conflict of interest regarding the used materials and the reported results. 1. Banerjee A, Deaton A, Duflo E. Health, health care, and economic development: Wealth, health, and health services in rural rajasthan. Am Econ Rev. 2004;94(2):326-30. doi: 10.1257/0002828041301902. [PubMed: 19305517]. 2. Udpa S. Activity-based costing for hospitals. Health Care Manage Rev. 1996;21(3):83-96. [PubMed: 8832280]. 3. Jerico Mde C, Castilho V. Cost management: the implementation of the activity-based costing method in sterile processing department. Rev Esc Enferm USP. 2010;44(3):745-52. [PubMed: 20964053]. 4. Ridderstolpe L, Johansson A, Skau T, Rutberg H, Ahlfeldt H. Clinical process analysis and activity-based costing at a heart center. J Med Syst. 2002;26(4):309-22. [PubMed: 12118815]. 5. Eichler HG, Kong SX, Gerth WC, Mavros P, Jonsson B. Use of cost-effectiveness analysis in health-care resource allocation decision-making: how are cost-effectiveness thresholds expected to emerge? Value Health. 2004;7(5):518-28. doi: 10.1111/j.1524-4733.2004.75003.x. [PubMed: 15367247]. 6. Pineno CJ. The balanced scorecard with time-driven activity based-costing: An incremental approach model to health care cost management. J Health Care Finance. 2002;28(4):69-80. 7. Pignone M, Earnshaw S, Tice JA, Pletcher MJ. Aspirin, statins, or both drugs for the primary prevention of coronary heart disease events in men: a cost-utility analysis. Ann Intern Med. 2006;144(5):326-36. [PubMed: 16520473]. 8. Dernovsek MZ, Prevolnik-Rupel V, Tavcar R. Cost-utility analysis. Med Decis Making; 2007. doi: 10.1007/978-1-4020-5779-3_20. 9. Van Howe RS. A cost-utility analysis of neonatal circumcision. Med Decis Making. 2004;24(6):584-601. doi: 10.1177/0272989X04271039. [PubMed: 15534340]. 10. Kim S, Mortaz Hedjri S, Coyte PC, Rampersaud YR. Cost-utility of lumbar decompression with or without fusion for patients with symptomatic degenerative lumbar spondylolisthesis. Spine J. 2012;12(1):44-54. doi: 10.1016/j.spinee.2011.10.004. [PubMed: 22169001]. 11. Begos DG, Modlin IM. Laparoscopic cholecystectomy: from gimmick to gold standard. J Clin Gastroenterol. 1994;19(4):325-30. [PubMed: 7876516]. 12. Bodner J, Hoeller E, Wykypiel H, Klingler P, Schmid T. Long-term follow-up after robotic cholecystectomy. Am Surg. 2005;71(4):281-5. [PubMed: 15943398]. 13. Siddiqui T, MacDonald A, Chong PS, Jenkins JT. Early versus delayed laparoscopic cholecystectomy for acute cholecystitis: a meta-analysis of randomized clinical trials. Am J Surg. 2008;195(1):40-7. doi: 10.1016/j.amjsurg.2007.03.004. [PubMed: 18070735]. 14. Gurusamy K, Samraj K, Gluud C, Wilson E, Davidson BR. Meta-analysis of randomized controlled trials on the safety and effectiveness of early versus delayed laparoscopic cholecystectomy for acute cholecystitis. Br J Surg. 2010;97(2):141-50. doi: 10.1002/bjs.6870. [PubMed: 20035546]. 15. Wilson E, Gurusamy K, Gluud C, Davidson BR. Cost-utility and value-of-information analysis of early versus delayed laparoscopic cholecystectomy for acute cholecystitis. Br J Surg. 2010;97(2):210-9. doi: 10.1002/bjs.6872. [PubMed: 20035545]. 16. Taghadosi M, Aliakbarzade Arani Z, Gilasi HR. Quality of life in patients with ischemic heart disease. J Nurs Mid Sci. 2014;1(1):19-26. 17. Chapko MK, Liu CF, Perkins M, Li YF, Fortney JC, Maciejewski ML. Equivalence of two healthcare costing methods: bottom-up and top-down. Health Econ. 2009;18(10):1188-201. doi: 10.1002/hec.1422. [PubMed: 19097041]. 18. Yereli AN. Activity-based costing and its application in a Turkish university hospital. AORN J. 2009;89(3):573-6. 579-91. doi: 10.1016/j.aorn.2008.09.002. [PubMed: 19269382]. 19. Baker JJ, Boyd GF. Activity-based costing in the operating room at Valley View Hospital. J Health Care Finance. 1997;24(1):1-9. [PubMed: 9327354]. 20. Baratti D, Scivales A, Balestra MR, Ponzi P, Di Stasi F, Kusamura S, et al. Cost analysis of the combined procedure of cytoreductive surgery and hyperthermic intraperitoneal chemotherapy (HIPEC). Eur J Surg Oncol. 2010;36(5):463-9. doi: 10.1016/j.ejso.2010.03.005. [PubMed: 20363094]. 21. Cinquini L, Miolo Vitali P, Pitzalis A, Campanale C. Process view and cost management of a new surgery technique in hospital. Bus Process Manag J. 2009;15(6):895-919. 22. Whiting JF, Martin J, Zavala E, Hanto D. The influence of clinical variables on hospital costs after orthotopic liver transplantation. Surgery. 1999;125(2):217-22. [PubMed: 10026757]. 23. Rajabi A, Dabiri A. Applying Activity Based Costing (ABC) Method to Calculate Cost Price in Hospital and Remedy Services. Iran J Public Health. 2012;41(4):100-7. [PubMed: 23113171]. 24. Papi C, Catarci M, D'Ambrosio L, Gili L, Koch M, Grassi GB, et al. Timing of cholecystectomy for acute calculous cholecystitis: a meta-analysis. Am J Gastroenterol. 2004;99(1):147-55. [PubMed: 14687156]. 25. Macafee DA, Humes DJ, Bouliotis G, Beckingham IJ, Whynes DK, Lobo DN. Prospective randomized trial using cost-utility analysis of early versus delayed laparoscopic cholecystectomy for acute gallbladder disease. Br J Surg. 2009;96(9):1031-40. doi: 10.1002/bjs.6685. [PubMed: 19672930]. 26. Morris S, Devlin N, Parkin D. Economic analysis in health care. John Wiley and Sons; 2007. 27. Padilla GV, Grant MM, Ferrell B. Nursing research into quality of life. Qual Life Res. 1992;1(5):341-8. [PubMed: 1299466]. 28. Loomes G, McKenzie L. The use of QALYs in health care decision making. Soc Sci Med. 1989;28(4):299-308. [PubMed: 2649989]. 29. Duron VP, Nicastri GR, Gill PS. Novel technique for a single-incision laparoscopic surgery (SILS) approach to cholecystectomy: single-institution case series. Surg Endosc. 2011;25(5):1666-71. doi: 10.1007/s00464-010-1374-6. [PubMed: 21057963]. 30. Szabo K, Rothe A, Shamiyeh A. Laparoscopic cholecystectomy – review over 20 years with attention on acute cholecystitis and conversion*. Eur Sur. 2012;44(1):28-32. doi: 10.1007/s10353-012-0072-0.